Art Asylum sends out word that the Toys “R” Us Marvel Minimates Series 16 have hit Toys “R” Us stores. Series 16 is the Marvel Now wave and features characters in all their redesigned glory. 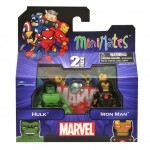 Reports are coming in that the 16th series of Marvel Minimates at Toys “R” Us has started to show up in stores! Featuring the latest costume designs from Marvel Now, this series includes Uncanny Avengers Captain America and Scarlet Witch, the Indestructible Hulk and the Invincible Iron Man, the Savage Wolverine with a vicious Reaper, and Phoenix Five Colossus and Emma Frost. Look for them in Toys “R” Us stores now – and on toysrus.com any day now – and check out our new shots of the full 2-inch mini-figure assortment! 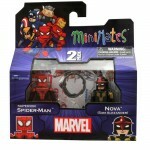 Art Asylum has posted new in-package images for the upcoming Marvel Minimates Series 51. We got to see these figures up close during our coverage of the DST’s Marvel Display at SDCC 2013. When will then be Now? Soon! We’ve already shown you Marvel Minimates’ Toys “R” Us Series 16 in packaging, with the biggest heroes of Marvel Now, but now there’s even more Now! Specialty Series 51, coming exclusively to comic shops and specialty stores next month, will feature seven more Marvel Now characters, and we’ve got packaged shots! Superior Spider-Man comes packed with the new Nova, Sam Alexander; Shanna the She-Devil comes with a Reaper from the Savage Land; Nick Fury Jr. comes with a Heavy SHIELD Agent, and the rare variant of the series is Maria Hill with her own Heavy SHIELD Agent! Sure, the Reaper is also in TRU Series 16, but Fury Jr. comes with extra parts to make Commander Steve Rogers! That’s still seven new Now characters! Check out the packaged shots below, and pre-order from your local comic shop! Marvel Comics has been intriguing, startling and generally shaking up their readers ever since the launch of the Marvel Now initiative, in which books changed creators, teams changed rosters, and (of course) heroes changed costumes. Next month, Diamond Select will pick some of their favorite characters and gave them all-new, all-Now figures for Marvel Minimates Series 17 at Toys “R” Us! The line-up includes The Avengers‘ Hulk and Iron Man, Uncanny Avengers‘ Captain America and the Scarlet Witch, and Savage Wolverine‘s Wolverine and a Savage Land Reaper, as well as a fourth two-pack with Phoenix Five versions of Emma Frost and Colossus from Avengers vs. X-Men, to add to your AvX-themed collection. Check out the new packaging below, and keep checking Toys “R” Us stores and toysrus.com for them to arrive next month! Read on to see the in-package photos.